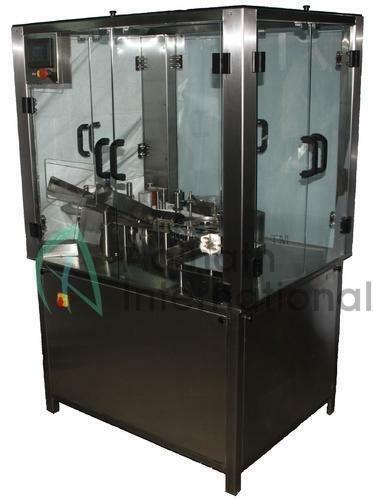 Automatic High Speed Ampoule Sticker Labeling Machine is one of the most user friendly machine. The machine is used for full/partial wrap around labeling on different size of round container. It is capable of labelling up to 250 containers per minutes depending on products and label size. The round containers positioned & accurate spacing between special type of rotary mechanising roller spacing device for wrap-around operation at the operation at the labelling point, an electronics product sensor sense container & relies a label from self adhesive label roll. If machine is equipped with batch printing device in that case batch printing device prints the batch no. & other matter on label during label is stationary means time between sensing of two label. The sensed round container moves on conveyor sticker label at labelling point wrapped around to container. Then the labelled container moves further through a rubber pressing belt & stationary rubber pad that ensures neat & perfect fixing of label.